Here on the blog, I shared when I came up with a kitchen and table linens storage solution, when I added a large printable above the bench (you can download a 9×11 copy of the printable HERE), when I made some changes to the gallery wall for fall, when I replaced the gallery wall with diy rustic industrial shelves and most recently was when I shared my Farmhouse Christmas Kitchen with you. But I wanted to come back today to take a closer look with all of the Christmas decorations removed and with the whole area pretty much back to normal. And BTW – you can read all about the diy projects that I did for this space and get the tutorials HERE. The first new addition to the breakfast area is an amazing new light fixture from Parrot Uncle. Have you ever added something to a room and then realized that it was just what the room needed? That was the case for me when this rustic/industrial beauty was installed. Oh, how I love it! I admit that I was a little afraid when I pushed the button to order this fixture. It sounded so much larger than the dinky one that was previously in this space. Even though I felt that the size of it was exactly what this area called for, I was relieved when it was hung and looked just right. Just look at all that rope and nailhead goodness. I definitely think that a diy installation of a fixture this size is a two person job. Pookie installed it along with some help from my daughter’s fella. It isn’t that the fixture was hard to install – the connections are just like any other – but this was a bit too heavy for me to help him with. I would say that the hardest part of the whole installation was getting the plate that goes against the ceiling perfectly lined up so that it was straight. The light fixture is well made and sturdy. I think it looks much more expensive than it actually sells for. Two of the light shades were missing when it arrived, but all I had to do was to let the folks at Parrot Uncle know and they sent a whole new set of eight shades right away. Here’s a closeup of the fixture. Did I mention all of the rope goodness that’s going on? What you can’t see in this photo is that rope is also wrapped around each of the lamp arms. Swoon. And the nailheads? I die. A huge, huge thank you to Parrot Uncle for providing me with the finishing touch for my breakfast area! (See my full disclosure policy HERE.) You can see their full line of pendant lighting HERE. They carry all sorts of lighting for every style, including cool floor lamps, which you can check out HERE. I’ve mentioned before, that our breakfast area sits in one of two turrets that are on the back of our house (the other is in our master bedroom). I love, love, love the panoramic view that it provides of our back yard, but it was a bit of a challenge to come up with window treatments that were a) affordable, b) easy to install and c) didn’t block any of the view. I always thought that I would go with diy faux roman shades on each of the windows, but decided that they wouldn’t be quite right. My solution was an affordable, no-sew, drapery option. You can see how I put the whole window treatment together HERE. BTW, that’s the granite on the corner of the kitchen island that you see in the lower left corner in the photo. I almost always think that window treatments give most any room the finishing touch that it needs. In this case, they help to enhance the view instead of blocking it or detracting from it. My windows aren’t that dirty – it’s just the glare from the sun! Plus, the grays, whites and browns in the drapery fabric tie in perfectly with the rest of the room. Over on the sideboard, I replaced a few things after I removed the Christmas touches that I had added. 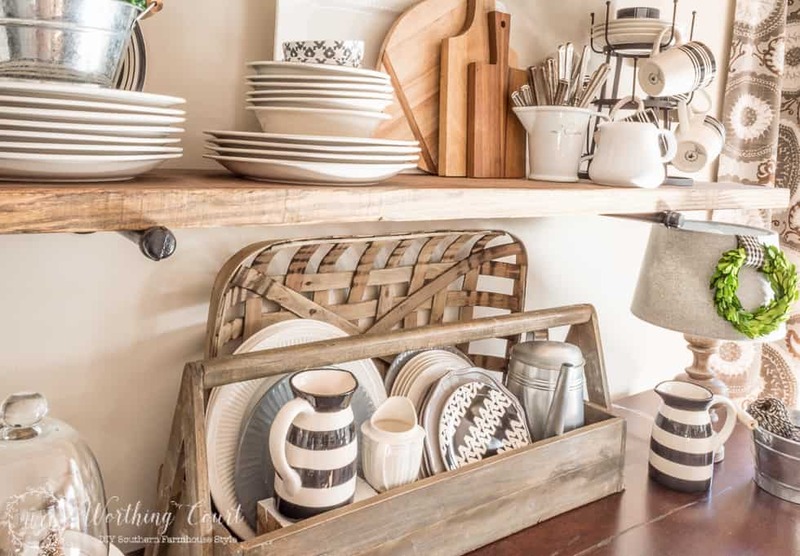 I filled my vintage looking toolbox with an assortment of black, white and gray dishes. How cute are the black and white striped pitchers? I found them in the dollar spot at Target last week. Did you spy the wood block that I used to raise the pitcher in the toolbox higher? Shhhh…don’t tell. 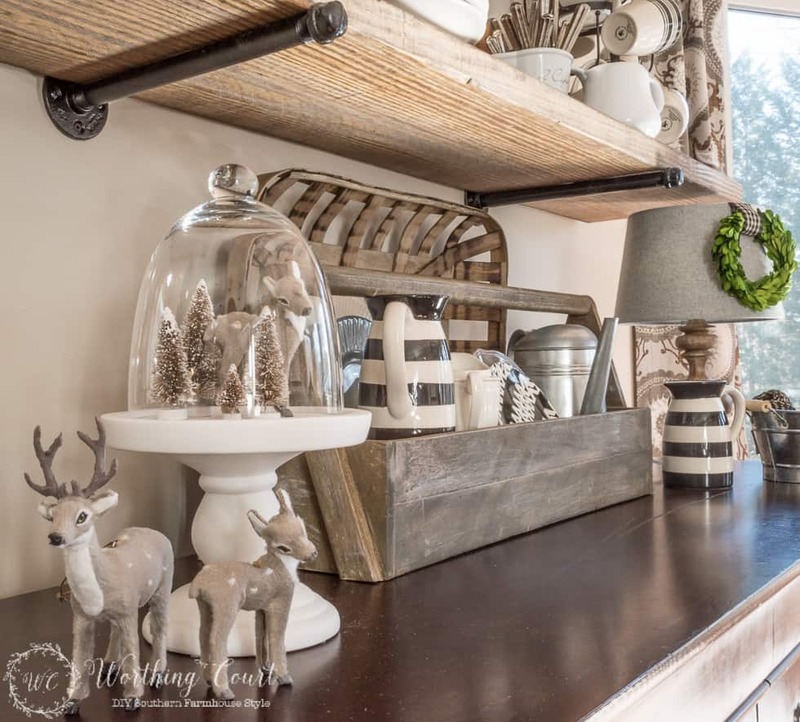 I added a little touch of winter with a few sweet deer Christmas ornaments and neutral bottle brush trees under a cloche. I allowed Mr. Wilbur to keep his position of authority, but removed the small silver Christmas ornaments that I had tucked into the wreath. I replaced the ginormous Christmas pinecones with a lantern holding an artichoke stacked on a couple of gray plates and stole the black and white canisters from my laundry room. The addition of a faux boxwood orb, a white platter and a faux tobacco basket behind the toolbox completes the look that I’ll keep through the winter. Oh – I promised a you a before, didn’t I? Here is what the breakfast area looked like on the day that we first looked at the house. And here she is AFTER. Other than decorating the space, we replaced the vinyl flooring with hardwoods and painted with Sherwin Williams Accessible Beige. Oh, and we replaced all five of the windows in the turret too. Nowadays, this is my view from my spot on the couch, which I admit, I kind of like. And btw – our breakfast area and kitchen are one long room. The kitchen was a total gut job. Here she is all decked out for Christmas. 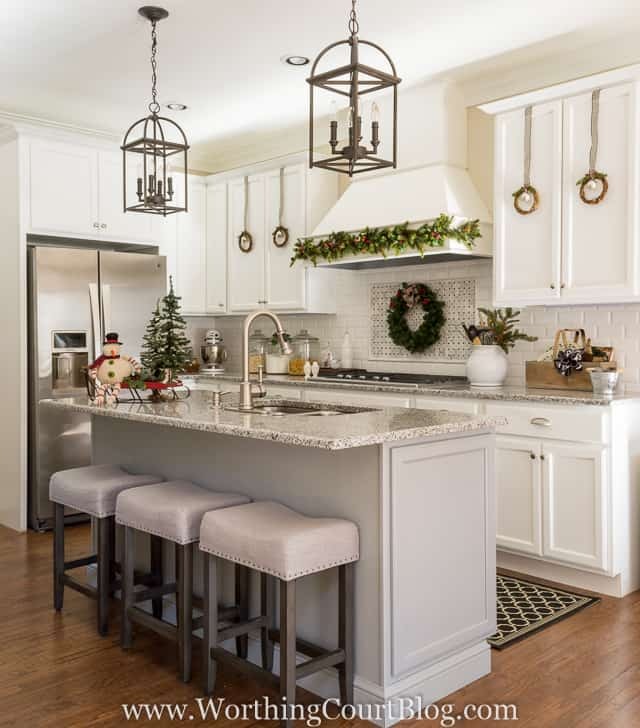 Click HERE to take the full kitchen tour. Thank you for stopping by to check out my breakfast area makeover today! 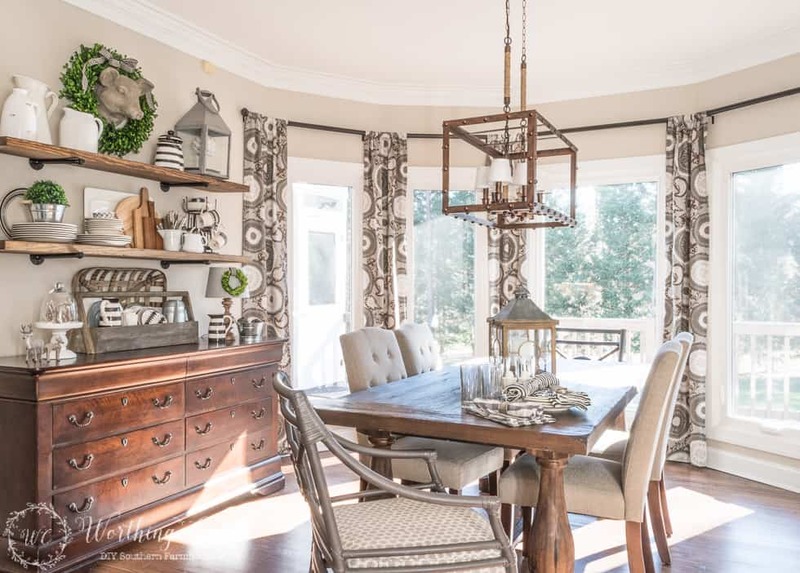 Wow, your dining room is so beautiful! I love everything about this space; from the amazing light fixture, the drapes, the shelves, and the bench with the large frame above. It is all so beautiful! Love your style and thanks for the inspiration! Hi MeMe. You’re too sweet – thank you so much! It’s stunning! You know I always love looking at your kitchen and this updated area makes it even more beautiful! What a huge difference from the original photo! I would be hanging out in there all day. Enjoy! Hi Shelley. I’m always amazed at the difference whenever I look back at the before photo of this whole space. I’m so glad that you like it – thank you! Just beautiful! I love the lightings no especially the drapes!! This is perfection! When you share the drape info, could you also please instruct how you did the rods around the bay? I’ve never figured out how to make drapes go around a corner and look seamless. Hi Dee. So glad that you like the breakfast area! I posted about how I put the window treatment together today. Let me know if you have any questions though and I’ll try to help. Here’s the link to the post: https://www.worthingcourtblog.com/projects-from-my-breakfast-area/. 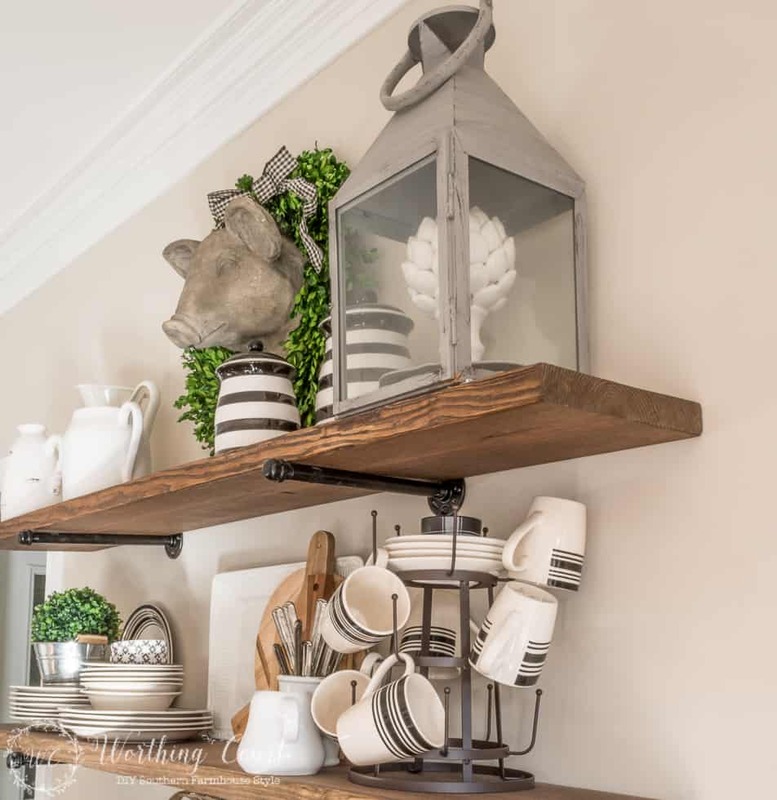 Keep sending the styling posts…it helps me think of ways to reinvent my decor displays. Hi Kelly. So glad that you enjoyed this post! Good luck with your hunt for the right fixture. You’re smart to wait for the right one. I’m terrible about doing that. BTW – what is MCM? 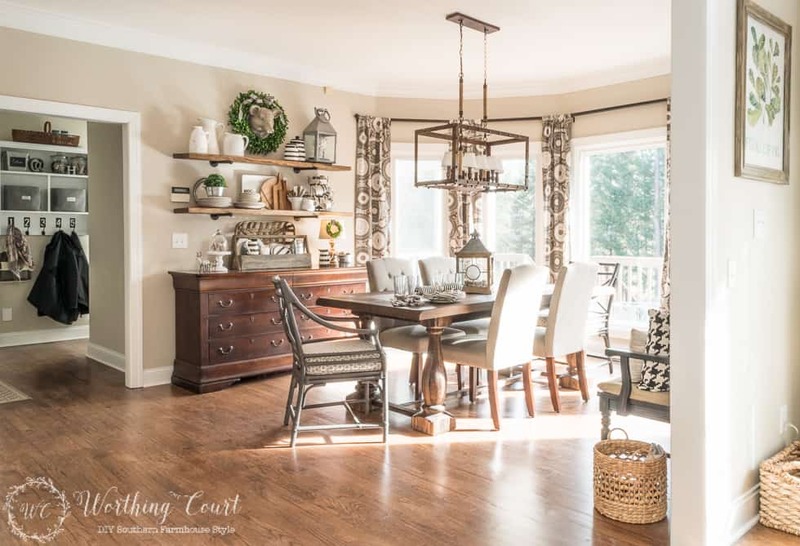 Susie, Your dining room is stunning and your transformation is beautiful! 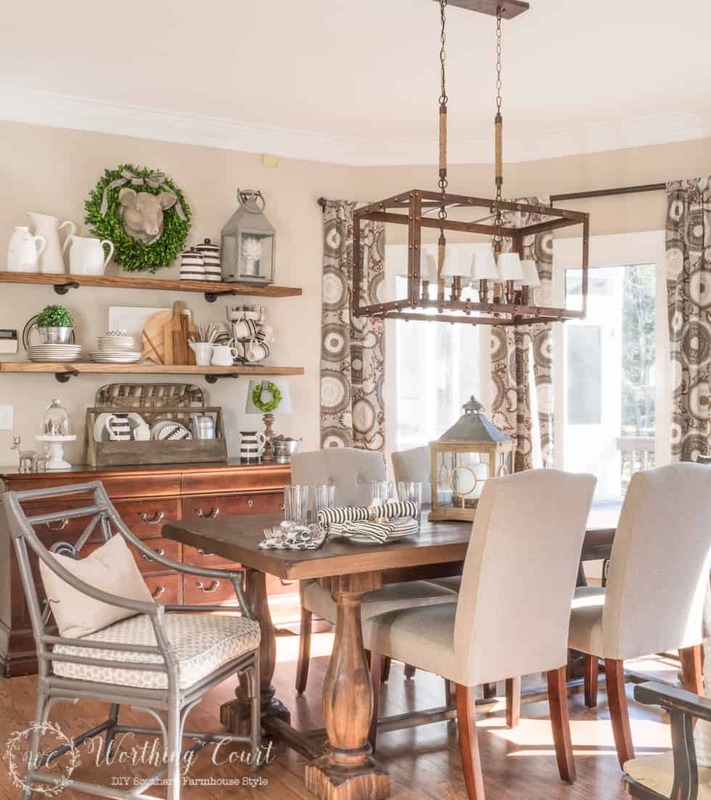 Love that handsome light fixture too! Hi Mary. I’m so glad that you like my breakfast room – thank you! Hope you’re doing well! Love every detail! Perfect and I know you are enjoying it! Suzy what a transformation! Love all the touches. I need to take a trip to Target! Black and white stripes are right up my alley!! YOU did a great job in your new kitchen!! Thank you so much, Kathysue! I’ve been tempted to go grab some more of those little black and white pitchers myself! It’s beautiful GF!!! The shelving, chandelier and window treatments are perfect final touches!!!! I wouldn’t want anyone to sit at the table and mess it up LOL. Thank you, Donnamae! It looked so huge when it first came out of the box and then sat on my floor waiting to be installed. Lot’s of second guessing myself was going on. What a beautiful space you have created. So different from the before picture! And that light fixture is spot on perfect! Thanks for sharing, and hope you have a peaceful, happy New Year. Thank you Jae and Happy New Year to you as well! Love you dining area! I have the pig (Millie ) in my dining area also! 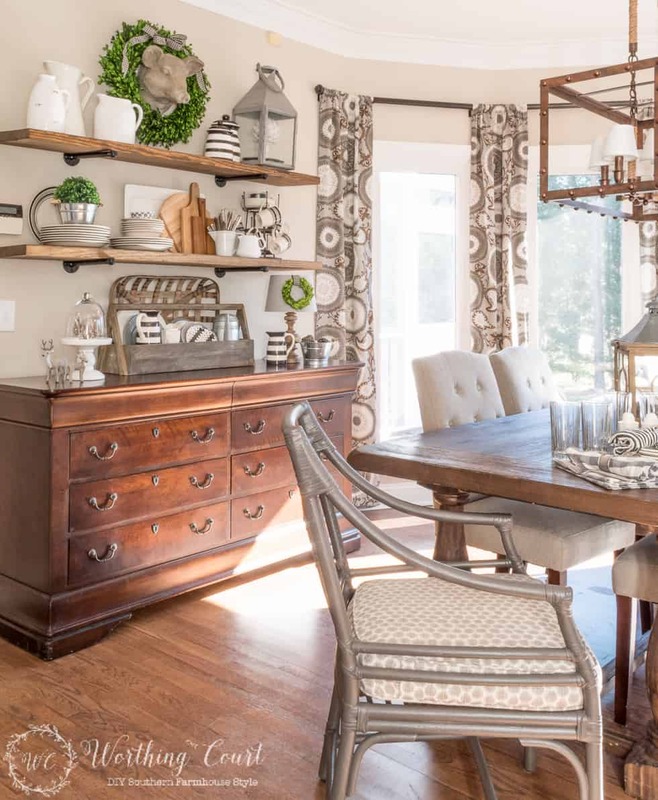 The transformation of the before and after is beautiful of your dining space! I am in the process of adding the open shelves above my side bar. So glad you like everything! Good luck with your shelves! They sure made a difference in my room. Where did you get the mounted pig (Mr. Wilbur)? Where are your upholstered chairs from? I ordered them from Walmart last year. I’m sorry, but I don’t have the direct link to them or know if they are available anymore. Target also had some. I love it so much! Everything is perfect! Forgive me if you’ve already answered this somewhere, but where did you get the dining room table? Absolutely beautiful! I love the light fixture you chose, and the curtains are my fave too! Aw – thank you so much, Nicki! 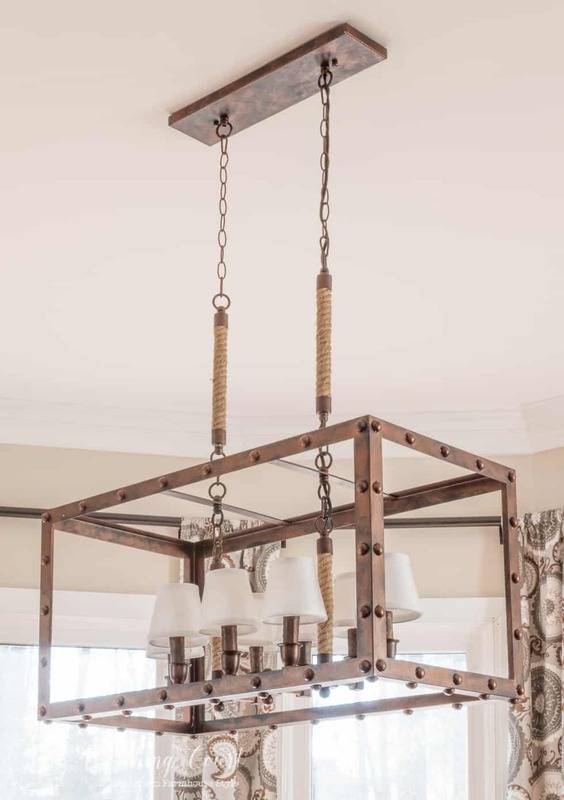 OH my word Suzy…I am so in love (and envy) with your new light fixture!! It fits the breakfast area perfectly. Thank you, Tina! Hope you have a great day too! So beautiful!! Would you share where you purchased your shelves? I love them! I love that you decorate for Winter!!! Wow, what a beautiful space. 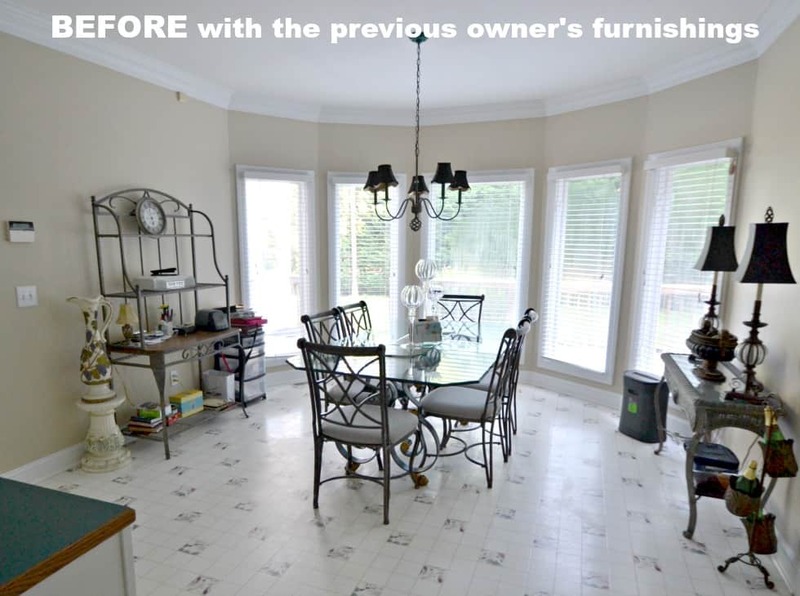 I love that picture you incorporated with the old owner’s furnishings – what a transformation. That light fixture you chose perfectly compliments the area. Thank you, Chelsea! So glad you like the light fixture too! Perfection! 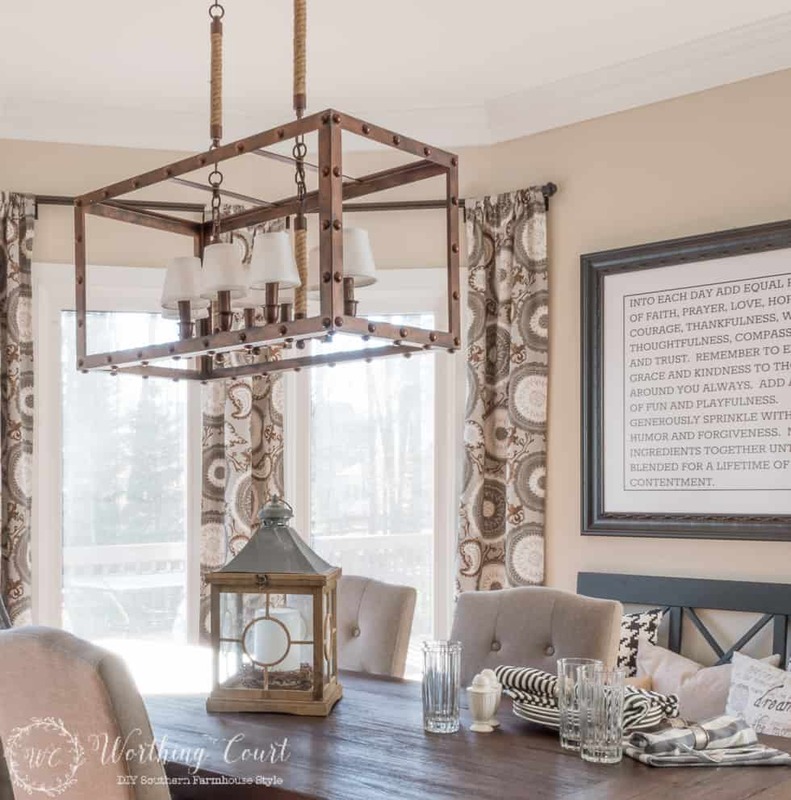 Love every detail and the light fixture is gorgeous and I agree, is just right for the space. Thank you so much for sharing with us at Snickerdoodle Sunday! What a beautiful breakfast room. Love all the light from those windows and your beautiful decorations. What a huge improvement…from cold and stark to warm and inviting. That light fixture! the shelves! curtains…ok all of it. Well done! I am a new follower. Love your blog! Thank you so much, Cecilia! Nice to “meet” you. Oh. What a dramatic difference. Thanks for sharing on the #HomeMattersParty . I hope you will join us again next week. Absolutely gorgeous! It has so much character, I really love the cow with the wreath around its neck. Thank you so much, Sam! That wreath makes dressing Mr. Wilbur up for the holidays kind of fun! Hi Suzy, I LOVE your eating area! It is stunning!! Your post will be featured this week at the Wonderful Wednesday Link Party from mustlovehome.com. Thanks again for sharing with us and I hope to see you there this week:) Hugs- Christine at Must Love Home. Wow – thank you Christine! Goodness Suzy what a fantastic job you’ve done! I love everything! 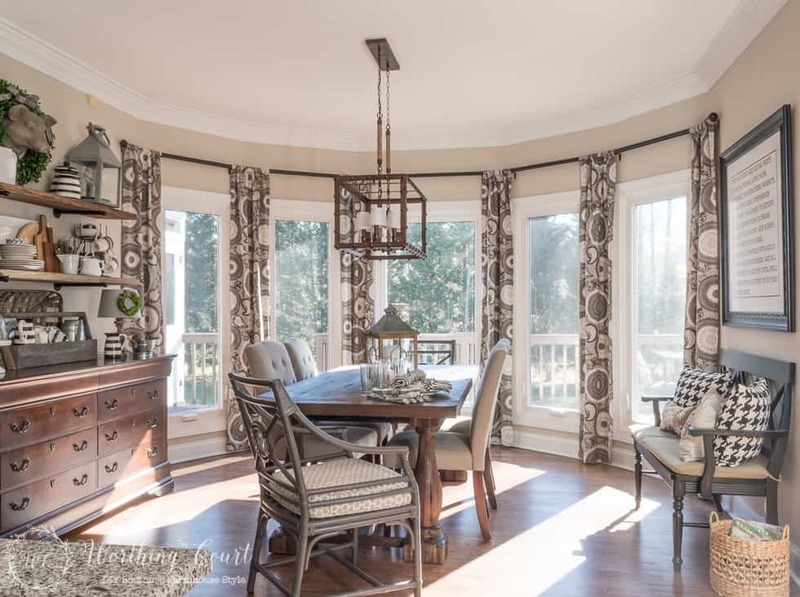 Those curtains highlighting the bay window are perfect and so is that new light fixture. You’ve warmed this area up beautifully. 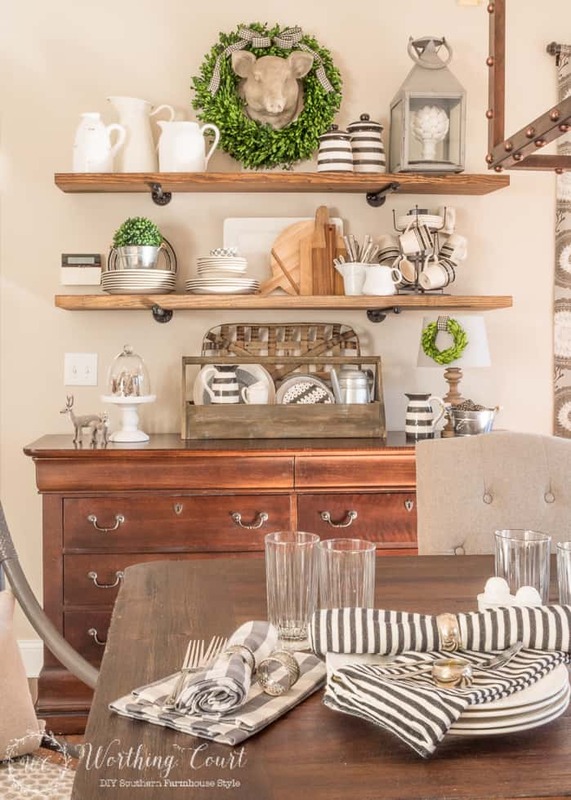 Love the side board and shelves on the wall and all the deco there. It sure looks different from when you bought it- excellent – really excellent! Hi Nanci. The wall color is Sherwin Williams Accessible Beige. So glad you like the room! Love your dining space, but you have soooo many pop-up ads it is hard to see anything before the aggravating ad pops up! I realize this is how you make your money, but this ad explosion interferes with your pics & content. Hi Kathryn. Thanks for giving me your input. I agree that the pop up ads are annoying and I’m planning to get rid of some of them. I only started out with a couple. Not sure why there are so many now! You are quite talented with ideas that I really like. I am a new follower who is amazed at what you do. Wow! Simply beautiful “after”. Bonus – I’ve been searching for the perfect pendant lights and believe you may have helped me to find them! Gosh! I love your sense of style!! Everything is beautiful! I’ve been meaning to ask you about your drapes and rods. I have a very similar set up but in my master bedroom just not as many windows and a slight angle just like your windows are. Where did you find your drapery rods that have a bend to them? I need to buy some ! Currently only have blinds up. Thx ! Where did you get the wicker end chairs from? Hi Melissa. I purchased them from someone on Craigslist several years ago. What an amazing difference. And I’m online now with Parrot Uncle. I’m excited to find this site. 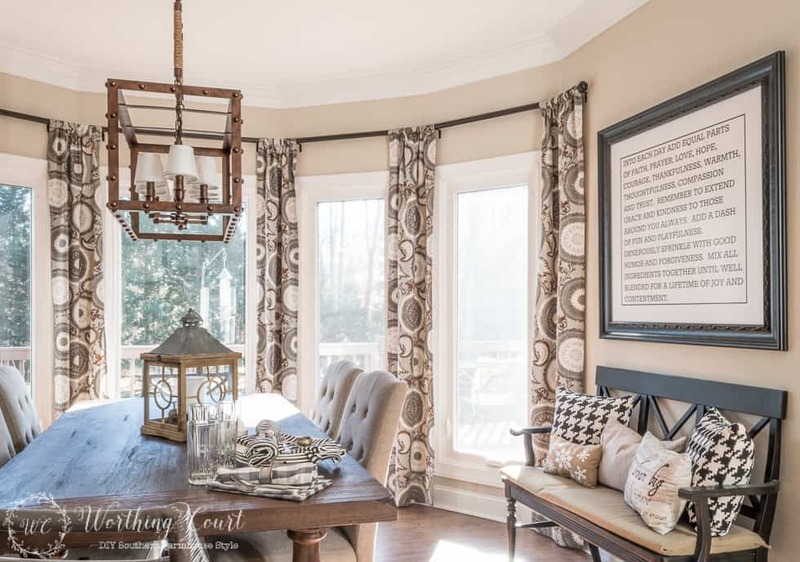 I love how you chose this substantial piece, it does anchor the room in a most perfect way, and the drapes – wow! All the little touches, nothing over done, just right! WHERE did you get that sining table!? Amazing space. Your kitchen/breakfast nook is absolutely stunning. I stumbled across your site when I was on Pinterest. I was wondering if you would share where you found Wilbur who watches over your nook. He is adorable 🙂 Thanks!